How much shade will this take? Will it really bloom all season? I’ll have to see if I can find it online as I haven’t seen this variety locally. Thanks for your comment. 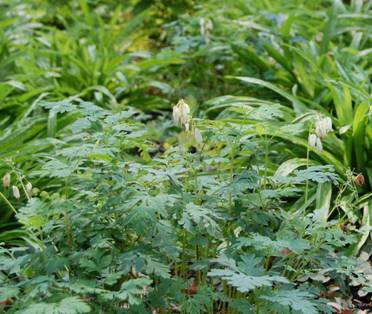 We have successfully planted Dicentra eximia ‘alba’ in filtered shade under high mature canopy trees. In our experience, Dicentra eximia ‘alba’ is a repeat bloomer, with a main bloom period in late spring/early summer and a quieter show again in fall. However, garden websites like Lady Bird Johnson Wildflower Center list it as a “long-blooming” plant that “can bloom from early spring to frost,” so it can have presence through the summer as well. Good luck and let us know how it does for you.